AI is touching every industry—healthcare, of course, but also education, transportation, finance and banking. It’s also contributing to a societal transformation that the McKinsey Global Institute says is happening 10 times faster, at 300 times the scale and roughly 3,000 times the impact of the Industrial Revolution. This Fourth Industrial Revolution, unfolding before our eyes, is the Age of Intelligence, a new era of artificial intelligence, interactive technologies, automation and augmentation of human capabilities. At AI’s root is the desire to improve and speed the pace at which data morphs into knowledge and action. Computational algorithms train on large datasets in search of patterns, learning and getting better at tasks over time. Software writes software, machines teach machines. In healthcare, for example, AI and machine learning are slowing the spread of infectious disease, detecting pulmonary nodules, strokes, diabetic eye disease, atrial fibrillation and lung cancer—and notifying the physician, and predicting busy periods in ERs. Machine learning also is uncovering imaging biomarkers that characterize changes in the brains of tiny infants with epilepsy and autism, enabling clinicians to understand their prognosis and guide treatment and intervention. A trio of factors is driving the momentum: massive amounts of patient data, advances in computational processing power and innovations in machine learning. Allowing machines to comprehend, sense, act and learn, AI is both augmenting and improving human capacity (Accenture, “AI is the Future of Growth”). The objective is to unlock meaning from data and put real-time knowledge to use at the point of decision-making. Think: physicians powered by targeted data unleashing their own perception, comprehension, innovation, awareness, cognition, discovery, apprehension, understanding, realization, intuition and insight. 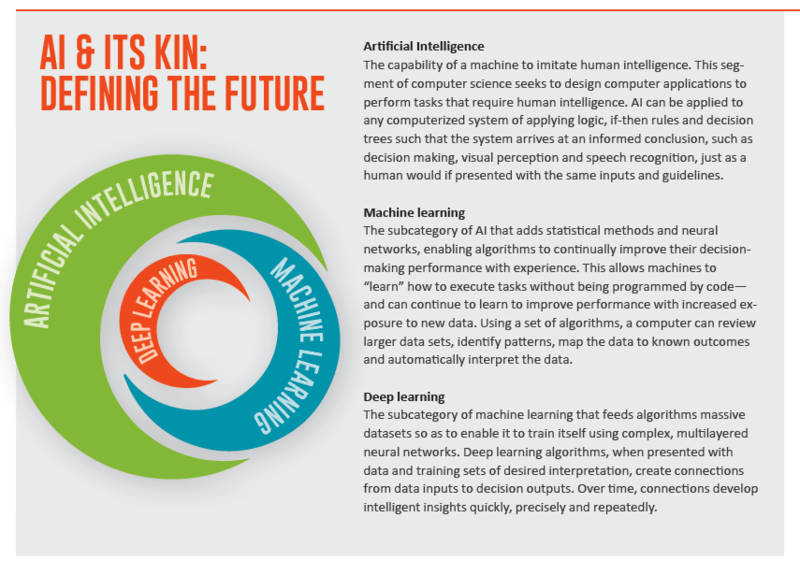 Artificial intelligence—and its siblings machine learning, and deep learning—is the bullseye for healthcare leaders. In a value-based world, they seek to improve care quality and access and control costs. Already, we are starting to see AI’s potential being realized in the form of enhanced care for individual patients and populations, delivered via boosts to research and decision-making. With AI streamlining data and responsibilities, the business of healthcare will get healthier, as will the work lives of caregivers. AI solutions soon will offer physicians and caregivers time savings in triaging urgent cases and work volumes. AI will assist their efforts to achieve accuracy and appropriateness while supporting the quality of their work lives. For the business office, AI will enhance business efficiency, scheduling, productivity and risk analysis. Administrators will watch patterns of patients, air quality and data, eyeball predictability and ferret out actionable data. Overall, AI and machine learning will allow imaging providers to staff better, utilize assets better, report better and bill better. AI’s value in patient care will be leveraged in earlier diagnosis, treatment, predictive and real-time decision-making. Algorithms will help physicians spot sepsis early, pick the best cancer treatments based on the mutations in a patient’s tumor or predict the likelihood of responding to a treatment based on the experiences of similar patients. And that’s just the start. Patients also will benefit from faster exams and report turnaround time; greater safety, quality and diagnostic certainty; and deeper engagement. Like the machine shops that replaced hand tools in the first Industrial Revolution, AI is augmenting human activity by taking over tedious tasks that machines, frankly, do better. Physicians are starting to benefit from machines predictively monitoring ICU patients and segmenting images and measuring organ volumes and by spotting factors of an image, data point, trend, texture, subtlety or nuance that even a radiologist’s trained eye cannot discern. Where cardiologists typically need 30 to 60 seconds to calculate the volume of a ventricle, AI today finds the answer in seconds. Physicians welcome and need the help. Are they threatened? No, their role is solid. AI is no longer up and coming, but rather is here and coming. And coming quickly. The FDA is greenlighting AI and machine learning applications at a healthy pace. The first clinical study extolling the merits of AI was published in a peer-reviewed medical journal in March. A team from Cleveland Clinic affirmed in the Journal of the American College of Cardiology the ability of a wearable, FDA-cleared, medical-grade EKG on the Apple Watch to accurately detect atrial fibrillation. When asked about the potential for AI, 54 percent of healthcare leaders say they believe AI’s role in medical decision support will expand considerably in five years, according to a survey by The Economist. Perhaps more interesting is the long-term forecast: 74 percent see big data and AI as major drivers in the identification of medical approaches for patients based on genetic, environmental and lifestyle factors (“The Future of Healthcare,” online Oct. 22, 2017). Growth in the healthcare AI market is surging and expected to reach $6.6 billion by 2021. That’s a compound annual growth rate of 40 percent. In just the next five years, the healthcare AI market will grow more than 10 times (Frost & Sullivan). Expectations for cost savings are significant as well. A study from Accenture predicts clinical health AI applications could create $150 billion in annual savings for the U.S. healthcare economy by 2026. Today we are watching and participating in a revolution in medicine and healthcare—from a focus on populations to individuals, and personalized medicine. Machines are helping human minds see more and do more. Medicine has until now relied on population-based diagnostic models of retrospective data sets that performed well, on average, but not for all. Going forward, we want to look at all patients—responders and non-responders to therapy and those with multiple chronic diseases that clinical studies today cannot factor in. No more standard of care that proves an obstacle with individual patients. To understand disease over time, we need to understand individuals. In the Age of Intelligence, the goal is generating more precise diagnoses and treatment strategies using individualized data to care for a specific patient—using AI on real data collected on real patients over a long period of time. There will be a fundamental change in evidence and thinking from linear to exponential. Can AI-powered clinical studies of the future offer answers for multiple chronic disease states? Real-time data will push aside retrospective data sets. The challenge is how to take all the information gathered, analyzed and synthesized and deliver it to the caregiver at the point of decision-making in real time. What does it all mean, and what should come next? With this magazine, we are starting a dialogue and gathering a community to watch, wonder at, admire and participate in the transformation of healthcare in the Age of Intelligence. Join us.